On Monday, November 14, Amazon UK launched their Kindle deal of the day. It heavily discounts one book for a 24-hour period. It’s quite a nice little offer and I bought Anne Holt’s Punishment for 99p, even though I haven’t had time to even start it yet. 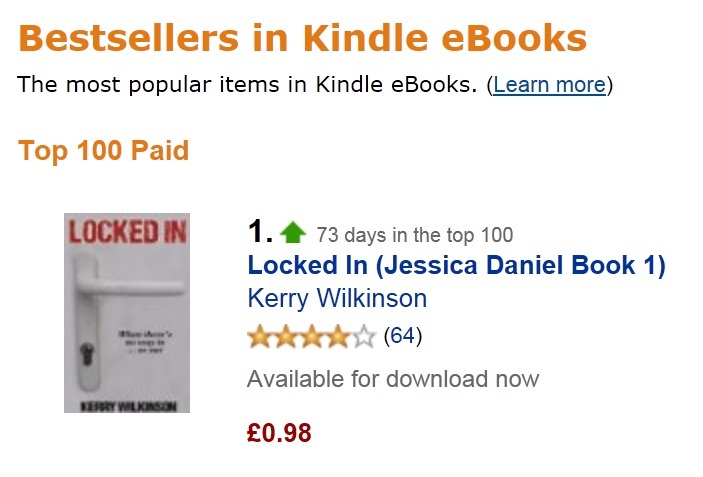 What it does do is skew the Kindle chart because the deal of the day pretty much always goes to number one. That means that everyone else is aiming to be with number two or three, depending on how many DOTDs are at the top. With that in mind, it was really nice for Locked In to return to No.1. I’ve been the top non-deal book for 22 straight days now and, of the 73 days it has been in the top-100, over 60 of them have been in the top-10. Book three, The Woman In Black, is out this week and I really hope you all like it.